Barcelona – The official first day of Primavera Sound was Thursday, it was the first day we would see the official Primavera Grounds and also featured a host of stellar acts from all genres of music including Of Momtreal, Public Image Limited (PiL), Grinderman, Big Boi and Girl Talk. The headliner of the night was the always amazing Flaming Lips. Let’s take a look at the acts. 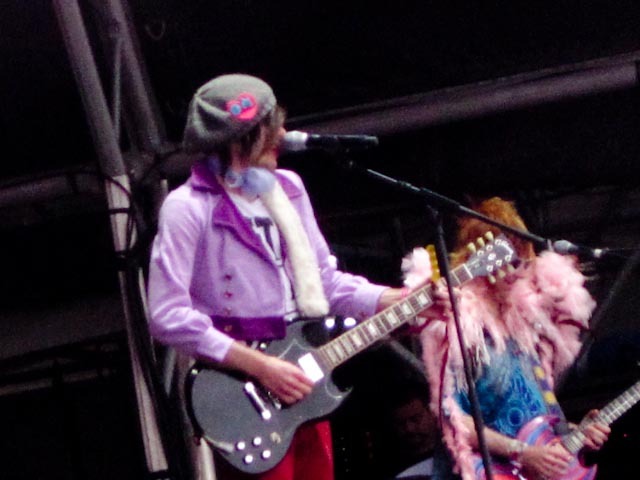 Given the headliners propensity for props, costumes and gimmicks alike, Georgia’s Of Montreal was an extremely fitting opener as they too were known for their theatrics. Dressed in a beret, purple blazer and red pants, Kevin Barnes and his band took the stage just after eight and delivered a spectacular performance that features as much theatrics as quality songs. Featuring some of the stronger tracks from recent releases such as Coquet Coquette, She’s a Rejector and Suffer for Fashion Of Montreal played an all killer, no filler set that highlighted what Of Montreal is about when they are at their best – quirky, but extremely catchy pop. Two costumed performers that dressed in all kinds of costumes from Mexican wrestlers to odd pig headed dancers were brought in to add additional visuals to the show. I’m not sure what the theatrics, which included a luchadore wrestling match and interpretive dancing were about, but It was visual galore. The set ended with my favorite Of Montreal song – A Sentence of Sorts in Kongsvinger . A great way to start off the night. At first, you would think that Big Boi would be an odd choice for Primavera given the other bands on stage, but you haven’t seen Europeans dance to hip hop. Atlanta’s Big Boi delivered an energetic show that brought some southern funk to the shores of Spain. The set consisted of both Outkast tracks and his solo material much to the delight of the crowd. Everyone was dancing as Big Boi and his group of MCs delivered energy track after track, all in tune with video projections. I don’t think anyone was crunking, but there was a definite sense of enthusiasm for the guy. For the encore, Big Boi brought on a bunch of ladies to dance to his hit single Tangerine. If getting some bodies moving was Big Boi’s goal for the night, then it was easily accomplished. The next show on my plate was Grinderman and they were awesome. I don’t think Nick Cave is capable of anything but awesome. Perhaps the only hard rock headliner of the festival – Nick Cave, Warren Ellis and company Just hit it hard. Between Nick Cave’s sermon like deliveries and Warren Ellis’s intense one man string section, the group just brought an intensity that just permeated through the crowd. Definitely one of the highlights of the festival. The next two acts were two indie rock bands from the early 2000s era that I had throughly enjoyed. Playing to almost two thousand people at the Pitchfork stage, the Walkmen absolutely had the crowd in a frenzy – people were dancing and singing along. I was only there for one song though, and that song was The Rat which for my money is one of the top songs to come from that era. If that song was any indication of the crowds enthusiasm for the Walkmen, then I imagine it would have been a heck of a performance. Taking the long 15 minute walk to the Llevant stage, I reacquainted myself with Interpol, the New York post punk band that exploded onto the scene with their incredible debut Turn On The Bright Lights and has since failed to recapture that momentum with each album producing diminishing returns. This was the first time I’ve seen the band since the departure of the infamous Carlos D but I was still excited to see them. The excitement soon disappeared as the band sounded flat and uninterested on stage. The newer material just felt like a retread on the older ones and even though Lights seemed to register as a high point with the crowd, it just doesn’t compare to their older material for me. Tracks from the first two albums were placed sporadically in the set list and while they were pleasant to hear again, the show just didn’t register well with me and I left early to grab a spot for the Flaming Lips show, which was already reviewed. A post Flaming Lips crowd was already all riled up by the time Girl Talk made it to the Llevant stage at 4:30 am. Taking the stage with a gaggle of dancers, Girl Talk finished off the first night of Primavera with his staple of classic rock/indie rock music mashed up with hip hop sound bites. Those with the energy danced their tales off and those who didn’t have that energy just watched with envy. The set ended sharply at 5:30 am and then everyone made the mad dash to find a taxi and get back home before the sun went up. All in all a fantastic way to start off Primavera, even if I didn’t get back to the apartment until 7:30 am.